We are excited to be offering several kits this Workshop! We will offer a large paper crafting kit as well as an Every Day in December kit! Also we will be offering some really fun project kits we will share as soon as our class is live next Monday! Our Crafting kit is insane! I fell in LOVE with My Mind's Eye's Comfort & Joy line the minute I saw it this Summer! I ordered it right away!! The paper is adorable & right on trend! Dying for all the fun Plaids!!! We packed this kit to the brim! Diecuts, Count Down, & Tags! Also 2 full large die cut alphas! 1 Gold & 1 Red Glitter! So much goodness in this kit! Our Everyday in December Kit is filled with all kinds of goodies perfect for documenting December! The Simple Stories Burlap album is filled with page protectors, an envelope & some fun pages! We've added some darling "extras" in this kit & if you're signed up you'll get the "bonus" 4th video where I'll share some of the things I've done over the years documenting December! This kit's retail is Valued well over $100 for $60 grab kits NOW! This line is SOLD OUT! So when they are gone they are GONE! Happy Fall! Halloween is just a few days away! Can you believe Christmas is just 59 days away! WHAT! It's time to start thinking Spark your Christmas!! We are planing & creating & gathering some really fun ideas to share with you!! Sign up today & get our Early Bird Price of $22.99 this will be a full 3 video Workshop with up to 30 ideas & projects! Can't wait to see you online! Class starts Monday, November 21! Spark Sisters! We've put together a fun Papercrafting kit just for you! So many fun extra goodies to make your Halloween Spooky! It's time to start thinking Fall, cooler temps, changing leaves & yes! Halloween! Due to a crazy travel & teaching September we will be offering a Mini Spooky Spark! 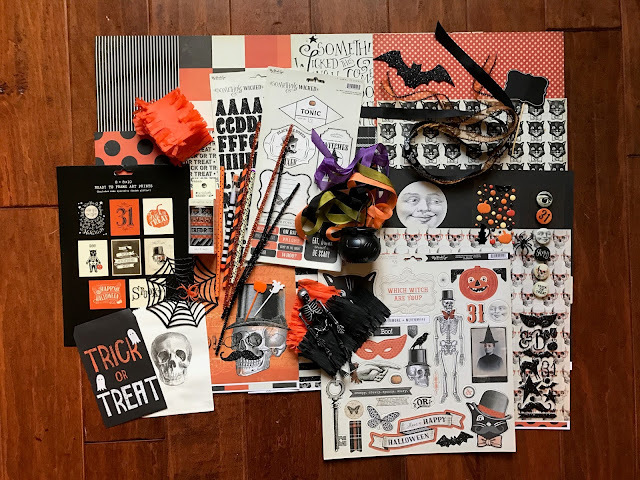 A two video workshop full of Halloween goodies! Home decor, Tablescapes, mantle ideas & a goolish wreath for the door! I hope you join us & celebrate Halloween with us!! Also, we Sold Out of the On Trend Kit so quickly & tried to get more but the 12x12 paper packs are SOLD OUT! This line is so popular! We were able to get 6X6 pads & have lowered the kit price to $30!! We only have 10 kits to sell & then it's GONE! We have a few of the Happy Camper kits left too so if you didn't get one grab one QUICK! ALL KITS WILL SHIP FRIDAY!! We hope you're having a great Sunny Day! This kit includes a 6x6 paper pad INSTEAD of the 12x12 paper!